The Gourmet Reserves product line is unique in the industry as it provides the largest variety of foods available in shelf-stable cans appropriate for long-term food storage. Our menus consist of everyday foods and meals that are enjoyed by adults and children. Various systems are available, tailored to meet the needs of any customer. Our foods are created to be consumed anytime/anywhere with hot or cold water convenience. Gourmet Reserves has shelf stable food systems and individual items designed to meet your needs with food that is nutritionally sound, convenient, and familiar. Our systems are practical and easily incorporated into your daily diet. Our exclusive "No Cooking Required" systems are easy to prepare. 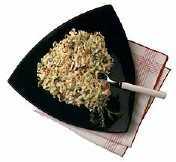 Items are eat-as-is or prepared by adding hot or cold water to reconstitute. We have selected the very best quality foods, (freeze-dried, dehydrated, instant) completely free of artificial additives. The systems are assembled to supply both your long-term and short-term needs. Most of our food storage items are either freeze-dried or dehydrated. These processes are ideal for long-term food storage. Freeze-dried foods keep 90% of their nutritional value, dehydrated foods keep 80%, and canned goods from grocery stores keep 50% to 60%. Freeze-dried products make up the majority of ingredients used for Gourmet Reserves. For instant or quick rehydration of certain dried foods and for products which retain their shape and texture, freeze-drying is the preferred method. The first step in freeze-drying is to rapidly freeze the food. The water content, now frozen, is turned directly into a gas and withdrawn from the food during the next steps, vacuum and heat, thus avoiding the shrinkage. Many of Gourmet Reserves products are custom freeze-dried to suit our strict quality requirements. Freeze-dried products include: grains, beans, fruits, meats, seafood, pastas, vegetables, and eggs. Using this process, 98% of the moisture is removed. The standard method of dehydrating vegetables and spices is to place the items on a conveyor belt and run them through an oven at a high temperature for a relatively short time. Between 90% and 95% of the moisture is removed. Some vegetables are more suited to this form of drying than others. This means that with the addition of water, the product rehydrates back to its original state more easily. Preferable items include: onions, bell peppers, tomatoes, celery, carrots and mushrooms. Dehydrated items such as peas, corn and green beans do not rehydrate as well as freeze-dried. Almost all of our food items require rehydration. Rehydration requires that you add water to the freeze-dried or dehydrated item and wait a few minutes til the food saturates all the water or rehydrates. It is a simple and quick method to prepare most food storage items. Some day you may actually need to depend on a food storage system. The purchase of a food storage system represents a sizable investment. The consumer should be discriminating in selecting the manufacturer. The questions and information below provide a valuable process by which one can identify and determine the most suitable food storage system. Under what scenarios do you anticipate the need for using food reserves? Will food preparation facilities, supplies, and fuel be available? Have you determined the length of time you desire the system to sustain you and your family? How many people will be depending upon your food? Are there special nutritional requirements? Click here for Nutritional Data. How important is ease of preparation? How many calories do you require per person? PURITY OF INGREDIENTS - Gourmet Reserves foods are all natural, NO artificial preservatives, flavorings, colorings, MSG, or white sugar. Click here for Ingredients. FAMILIARITY - Your food system should be familiar everyday foods easily recognizable and reflect a balanced diet offering good taste. Gourmet Reserve foods offer the best selection from which to choose. PREPARATION CONVENIENCE - Gourmet Reserves offers many convenient food storage systems which can be prepared with a limited amount of fuel and water. SHELF LIFE - Shelf life of any food reserves is always critical. Gourmet Reserves uses the latest technologies available to ensure long shelf life. Excessive heat will shorten the shelf life of all products. A rule of thumb: the cooler the better. Click here for Shelf Life information. VARIETY - We have over 170 selections that will prevent appetite fatigue. WHAT MAKES GOURMET RESERVES® FOOD STORAGE SYSTEMS DISTINCTIVE? The largest "No Cook" product selection available in shelf stable cans. We are an established, trusted industry leader with a distinguished reputation since 1979. We offer an extensive variety of products packed in small and large cans. Items include: complete "No Cook" entrees, breakfasts, side-dishes, individual items, complete food storage systems from one day to one year, standard commodities, and emergency systems. Our manufacturing facilitiy is inspected daily by a U.S.D.A. resident inspector and complies with strict standards for wholesomeness and cleanliness. Federal inspection enables us to offer a complete line of real poultry and beef products both as individual items and in meals. We have the largest selection available. We use state-of-the-art canning and oxygen-reducing techniques to provide for long shelf life. We offer great tasting, easy-to-prepare complete meals and individual items. Ingredients used are of the highest quality and are nutritionally superior. Our products are familiar, everyday foods enjoyed by adults and children. Our packaging is distinctive and professional. We continue to lead the industry with innovation and integrity. All GOURMET RESERVES® products are packed in #10 size cans (approximately one gallon) or #2 1/2 size cans (approximately one quart). These cans are heavy-gauge metal and enamel-coated on both the inside and outside to guard against rust and moisture. We use a "state of the art" oxygen absorber in all of our cans and pouches to maintain freshness and shelf life by eliminating oxygen. This procedure ensures the very best in shelf life. Resealable plastic lids are included in all systems and on individual cans. Avoid exposure to sunlight, heat and moisture. Make sure foods are not accessible to insects or animals. Never store food directly on the ground or on concrete floors - moisture can build up inside containers. Avoid such storage places that experience temperature build-up such as attics, garages or car trunks. Ideal food storage conditions: Temperature: 40-70 degrees Fahrenheit. Humidity: 55% or less. Store in a location that's accessible so that periodic inspections are easy. Avoid excessive and rough handling of pouch and canned foods. It is best to store all items in a cool and dry environment like the basement, under a bed is also good. The 55 gallon drums we offer for water storage are designed to have weight stacked on them when filled with water, these would serve as a good base to stack your food and also save space while keeping your food storage and water storage together. We offer serious campers, hikers, and backpackers the best outdoor recreational food in the world. All foods are packaged in sturdy foil pouches with no cooking required. All items are easy and convenient to use with minimal time needed for preparation. No fuss, no mess, no cleanup. Many of the items are "eat-as-is" or instant. We offer quality nutrition in a wide variety of exciting recipes. Our reputation for nutrition is surpassed only by our distinction for outstanding taste. There are no artificial preservatives, flavorings, colorings, MSG, or white sugar in our foods. We select only the best freeze-dried, dehydrated ingredients and spices available for our gourmet recipes. A "state of the art" oxygen absorber is added to each pouch prior to sealing to ensure freshness. No time, no oven, no water...no problem. Now, thanks to a new food technology, you can have a delicious entree at the mere pull of a strap. These hassle-free Inferno meals are ideal for outdoor activities and everyday use. Now, whether you backpack, bike, hike, surf, ski, canoe or sail, you can have a hot meal at your fingertips. Currently, you can choose from entrees such as Chicken Pasta Parmesan, Hearty Beef Stew, Homestyle Chicken Booyah, and Mountain Chili. For more information about our Inferno self heating meals click here Self Heating Meals. Members of the 35th Anniversary Everest Assault party say, "When food tastes great above 17,000 feet, you know it's high quality." After three separate Everest expeditions fortified by AlpineAire, they know what they're talking about. ALPINEAIRE GOURMET RESERVES® ARE UNIQUE (FREEZE-DRIED, DEHYDRATED, & INSTANT) STORABLE FOODS, THE VERY BEST VALUE IN THE INDUSTRY, AND WILL NEVER GO TO WASTE. 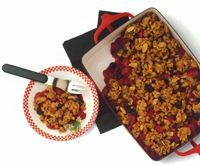 YES, THERE ARE CHEAPER DEHYDRATED FOOD STORAGE SYSTEMS AND ITEMS OUT THERE, BUT YOU WOULD NEVER EAT THOSE FOODS UNLESS YOU HAD TO IN A CRISIS, BECAUSE THEY SIMPLY DON'T TASTE VERY GOOD, ARE LESS CONVENIENT, AND THEIR NUTRITIONAL VALUE IS LESS. THEREFORE, IF MANY YEARS GO BY WITHOUT A CRISIS AND THE FOOD HAS TO START BEING USED (AFTER TEN YEARS OR SO) - YOU PROBABLY WON'T USE FOOD THAT DOESN'T TASTE VERY GOOD, AND YOUR TOTAL FOOD STORAGE INVESTMENT WOULD HAVE BEEN A WASTE. 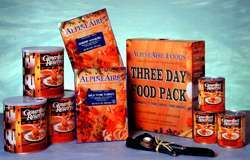 ON THE OTHER HAND, ALPINEAIRE FOODS ARE TASTY AND DELICIOUS, COMPARABLE TO FOOD RIGHT FROM THE GROCERY STORE - FOR ABOUT HALF THE PRICE OF STORE BOUGHT FOODS. YOU CAN EASILY SUBSTITUTE YOUR SUPERMARKET FOOD WITH ALPINEAIRE GOURMET RESERVES® AND BE COVERED BOTH WAYS (CRISIS OR NO CRISIS) NEVER WASTING A DIME. THIS IS WHY ALPINEAIRE FOODS IS THE BEST INVESTMENT AND VALUE IN THE INDUSTRY. THE BOTTOM LINE IS - YOU GET WHAT YOU PAY FOR.